For this write-up, I will explore CevaÕs Theorem, which states that given a triangle , the three lines , , and intersect at point iff . A GSP sketch is given below. An interesting fact about point P is that it may be anywhere on the plane. I will look at P in the following cases: (1) when P is the centroid, (2) when P is the orthocenter, (3) when P is the incenter, and (4) when P is the circumcenter. Case1: P is the centroid. By definition of centroid, P is the intersection of the medians of the triangle. Below is a GSP sketch of this case. Clearly, the ratio holds in this case. Case2: P is the orthocenter. 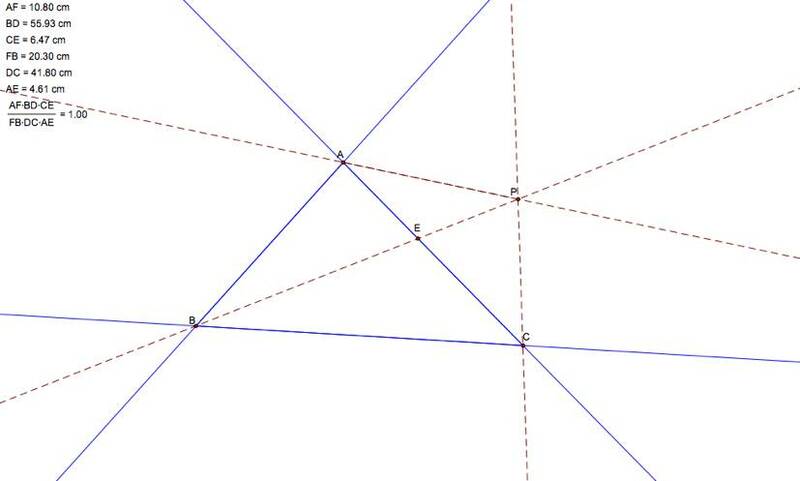 By definition of orthocenter, P is the intersection of the lines of the altitudes of the triangle. Below is a GSP sketch of this case. Case3: P is the incenter. By definition of incenter, P is the intersection of the angle bisectors of the triangle. Below is a GSP sketch of this case. Case4: P is the circumcenter. By definition of circumcenter, P is the intersection of the perpendicular bisectors of the sides of the triangle. Below is a GSP sketch of this case. Proof: Now I will show that given a triangle , the three lines , , and intersect at point iff . First I will assume that the three lines intersect at point P and then I will show that . To aid me in my proof, I will extend the segments AD, BE, and CF to be lines and I will draw a line through C, which is parallel to AB. Below is the new sketch. Now I will shade in a couple of the similar triangles that occur. so subtracting <PGC and <CPG from both sides yields . To show that , I can show that . By using (1), (3) and the property of transitivity, I get that . Solving for HC, I get . Solving for HC in (4) yields . By transitivity, . Now I will cross-multiply and get . Then, solving for GC in (2) yields and when I substitute that into my equality, I get . By simplifying and cross-multiplying, I get . Hence, . Thus far, I have shown one part of the proof. Now I will show the other part of the proof. I must assume that and then show that P must be a point of concurrence. Below is a GSP sketch of the triangle that is given. Assume that BE and CF intersect at P and AX has been constructed to go through P, but . Since AD and AX both go through P, we know that and . After simplifying, I get . Hence, P is the point of concurrence of , , and . Therefore, I have proved the theorem. A question that arises is how might this theorem help us to prove concurrency of the lines of altitudes if P is the orthocenter? First we need a sketch of when P is the orthocenter. The theorem states that given a triangle , the three lines , , and intersect at point iff . By CevaÕs Theorem, the three lines , , and intersect at point iff . LetÕs assume that . Substituting values from above, gives us . Therefore, the altitudes must be concurrent. Next I will generalize my result so that the point P may be outside the triangle. In order to do that, I must extend the sides of the triangle to be lines. A working sketch of this case may be found here.